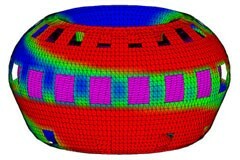 Scientists at the Max Planck Institute of Plasmaphysics (IPP), Germany, have examined possible ways to optimize future ITER discharges using a newly developed three-dimensional computer code called "Starwall". First calculations showed that using active feedback stabilization, the ITER plasma could remain stable up to a plasma pressure that would be 50 per cent higher than it would have been without such stabilization. Experimental investigations in IPP's ASDEX Upgrade tokamak device are planned to further investigate the findings. Read the IPP press release here.